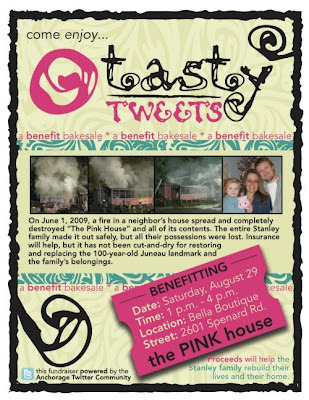 If you are on Twitter and follow other Alaskans, you may have noticed a series of tweets about a bake sale and Tweetup, called Tasty Tweets, set for Aug. 29 at Bella Boutique in Anchorage. It is the latest in a series of Tweetups - using Twitter to organize real-live meet-ups - that have been held in Anchorage since January, said John Proffitt, who is creator of AlaskaTweets.com, a Web site to inform those interested in local social media events. Proffitt, who is known among Alaska's Twitter users, has organized a majority of the local Tweetups. "I feel a kinship with many of the people I meet online, especially those I choose to follow on Twitter, and organizing these events lets me pay back that community for the affinity I have for the group," he said. Ryan Stanley said he also feels a kinship with people in Alaska's online community. Stanley, who lives in Juneau, said he uses Twitter specifically to connect with Alaskans. Although he has not been able to attend the Anchorage Tweetups, Stanley said he stays involved with the group by looking at photos and by reading posts about the events. "For the largest state in the union, it is the smallest state in the union. It's, I guess, a kind of unique thing you get to have a community that is spread out over such a large distance," he said. Stanley is a social media super user. Twitter, Facebook and FriendFeed are a few of many ways he stays connected. He uses Twitter to network with Alaskans, Facebook for national and international contacts, and FriendFeed to interact with his professional circle. His social networks are linked, so that one post goes to a variety of people. On the morning of June 1, 2009, a series of posts went out that touched many of Stanley's followers. "OMG. I'm standing here watching my house burn. Unbelievable." Stanley posted these in the early morning hours as he watched fire destroy his home and everything inside. The fire, determined as intentionally set, originated in the laundry room of his neighbor's apartment-style dwelling on Basin Road, Fire Marshal Dan Jager said. Since then, Stanley, his wife, Laura Hosey, and 3-year-old daughter, Meadow, have been trying to rebuild their lives. As I keep asking, please help in anyway you can. The Anchorage, Alaska Twitter community is coming together to volunteer its time and money to help out a friend — one we’ve never even met in person. Please join us in a random act of kindness. Help us get the word out about the August 29 Tasty Tweets Bake Sale via your nearest bulletin board, your blog, Facebook and more! We have more than 13 bakers preparing to fire up the ovens, break out the sugar and create cookies, cakes and pies, plus we’ll have coffee from Kaladi Brothers — you name it, the sweets will be ready for consumption and carry-out. And the plans include some fun stuff, too. If you are interested in helping out, tweet a message to @Valette or send e-mail to bakesale@alaskatweets.com. Got this in an email today and it had me giggling right-away. Hope you find it just as entertaining! Other men who were weaker and less skilled at hunting learned to live off the conservatives by showing up for the nightly B-B-Q's and doing the sewing, fetching, and hair dressing. This was the beginning of the Liberal movement..
Conservatives drink domestic beer, mostly Bud. They eat red meat and still provide for their women. Conservatives are big-game hunters, rodeo cowboys, lumberjacks, construction workers, firemen, medical doctors, police officers, corporate executives, athletes, members of the military, airline pilots and generally anyone who works productively. Conservatives who own companies hire other conservatives who want to work for a living. It should be noted that a Liberal may have a momentary urge to criticize or point out any perceived irregularities and angrily respond to the above before forwarding it. A Conservative will simply laugh and be so convinced of the absolute truth of this history that it will be re-posted or forwarded or immediately to other true believers and as well as more liberals just to tick them off. Awww, Come-on? This would be humor folks, you know? Funny?